Looking for cheap cat toys? Here are some inexpensive goodies that will occupy your kitty's attention, provide some exercise, and relieve boredom. Smaller toys will probably end up under the couch, behind the TV or the furniture, and generally in places where you won't see them for a long time. So, load up, they're cheap! (Almost) any cat will tell you that you can never have enough catnip mice around the house. Small catnip toys are generally inexpensive and most cats seem to get a lot of satisfaction out of them. Prices vary, but Amazon often has some low pricing on these types of products. You can get catnip spray (also available from Amazon) and treat the toys, either as a refresher when they get older, or for the non-catnip new toys. Place several of the toys in a freezer bag along with a few sprays of the catnip spray. Put it away in a cabinet and let it soak in for a couple of days. Your cats will love it. The Kong company makes a line of unique quality cat toys that are also inexpensive. The Kong Wubba for cats is catnip infused, and rattles. To make things more irresistible to your cat, the tails make a crinkling noise that cats love. The Hugga Wubba has longer tails for hind legs to kick at (cats often love to use those back paws to tear up their prey), and is soft and fuzzy. Does your cat like to play with the plastic rings from the milk carton. For some cats, these are hard to resist. But, they're not really cat safe and can be chewed through and possibly swallowed. So, get yourself some Doskocil Cat Crazies for your cat to play with instead. Make Your Own Cat Toys? Take one cat, and add a felt furniture pad. They fly, they flip, you can carry them around in your mouth (if you're a cat), and they scoot and roll. What could be more fun? Priscilla is preoccupied by the catnip in the ball toy, but the felt pad is just over there to her right. She loves them. Even better, though, are these catnip discs. 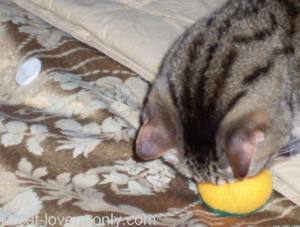 More talk about household items that can be used as homemade cat toys. So What's the Cheapest Toy? Oh, wait, it's actually this homemade toy in the video below. I think this gets the prize for the most creative of the cheap cat toys (and certainly inexpensive) but you're gonna need a deshedding tool like one of these (a FURminator) for this one. 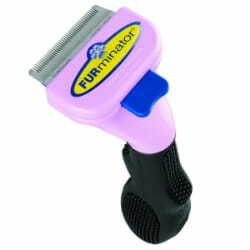 Get yourself a FURminator and have at it! More recommended picks include the Cat Dancer Original Action Cat Toy, and the Cat Charmer.